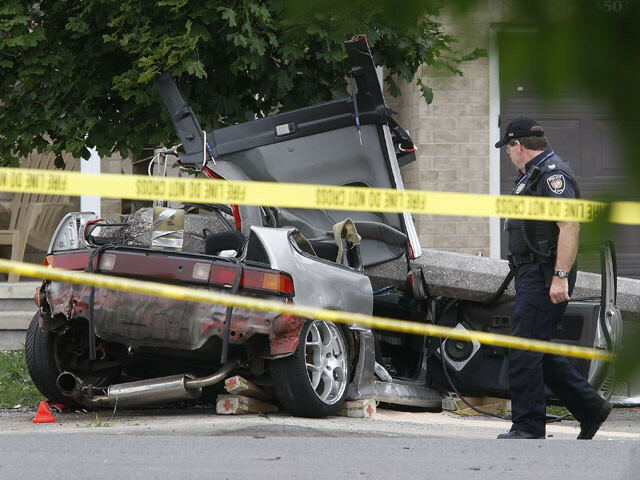 Some pics and video of a Crx crash that happened today in Ottawa. Street racing was to blame. Letting an 18 year old drive an old Honda Crx is like J-walking blindfolded !!! I will re-frame myself from saying exactly what I want to say about this guy. Even though he is dead. This accident was 100% preventable as even if he by accident flew into the wall wouldn't have resulted in that much damage he not been speeding. I tend to think these people die from a stupid choice sooner or later. I do feel very sorry for the family and can imagine how hurt his mother is. Those rims look like they are fixable though. Society should not feel sorry for people who decide to street race and cause deaths just like drunk drivers ! They know full well what it can lead to ! I have no remorse whatsoever. 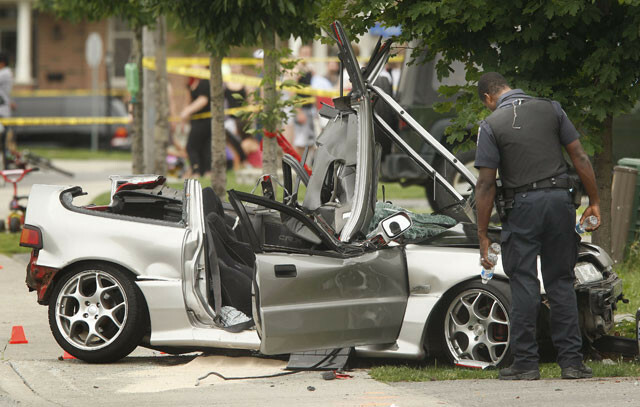 R.I.P..i dont support street racing,but thats not street racing there thats driving reckless threw traffic. and many of u can say what u want,but u all have taking ur lil civics and ran another car like a idiot at a red light or where ever. Agreed. It's not a tragedy it's stupidity. I would never race, nor would I ever drive at high speeds in residential areas. I tend to 'let it open up' on the 407 around say 12am-3am when I know there are very little-to-no people on the road with me. well... honestly his car seems prittyyy damn riced... don't mean to judge him... but he was PROBABLY the instigator...if he can't ignore some spoiled brats rolling in a stang then w/e mann really.. like residential too... not even a highway or some shyt.. smh..
i'm not gunna lie, i have. but never would i EVER speed in a residential.. i would kill myself if i ever ended up killing an innocent civilian...let alone for a couple seconds of excitement..
With regard to this tragedy, the family are the ones who suffer in this situation. That's the sad part, those who are left behind and the grief they must feel. Sorry remembered after I typed it, I'm an emotional typer and tend to proof stuff after I submit/print it. This is when a edit button comes in handy. That's just too bad, one 18 year olds lap in judgement ends up with him dead. This is one of my worst fears, getting in an accident in my crx. You have to remember its really just a tin can on 4 wheels that is to be respected. I know when I first got my b18c crx it scared the **** out of me, and that's why I take it to the track instead of speeding around public roads like a maniac, where a split second means life and death to you and others. I just took out my Crx today for summer.. let me tell you, I feel so vulnerable driving it.. I always look to see the cars behind me stop cuz if I ever get rear ended, I will feel lotsa PAIN ! CRX's are etremely unforgiving cars when it comes to even the most minor accidents !! my heart goes out to the kids parents i have owned 3 crxs in my time. And i have also street raced i guess i was lucky that i didnt kill anybody much less myself. It is such a waste for this kid to die so young R.I.P. you had a lot more to see and do in this life. Hey now, I own a Mustang too I have never ever once wanted to race a honda crx / civic / teg because honestly, 95% of the imports out there cant hang with a 450+ RWHP mustang, so why try? It's like the kid in grade 13 picking on a kid in grade 9, just always seemed retarded to me Flip side of that, almost all modded imports I have come across wanted to run from the lights be it if I am in the stang, the honda or the dodge. However, in the above instance it is clear the CRX has lost. Street racing has always been retarded. Even back in the TSR days you could take 5 seconds, look around at the handful of idiots at the street races and know that sooner or later 'some' accident would occur. Now, this is not to say all people at the street races are in incompetent of handling big power cars. 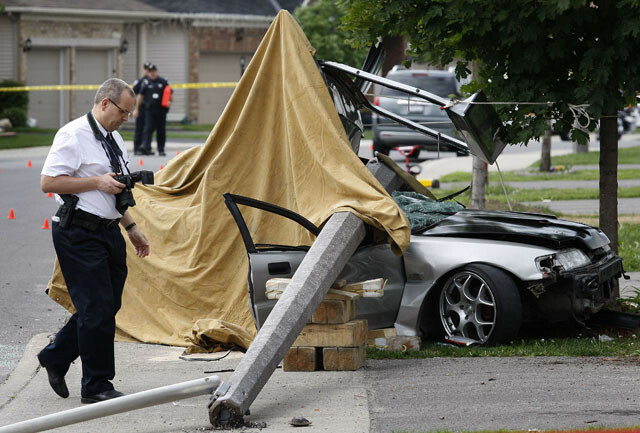 The reality is you take high powered or fast cars and put them in an environment with many unpredictable factors, you end up with damaged property, higher insurance rates and in this instance, a post on TCC about some kidding meeting death early. Shame, I cant imagine what his parents are going through right now, what a waste. However, in the above instance it is clear the CRX has lost. maybe he was ahead and lost control? It's a shame it had to end this way. good quote to live by people, unless its on an enclosed track ofcourse. Regardless of what happened, how it happened, who did what, what he did, what he shouldn't have done; it is not reversible and now another life has been lost. ... It is very unfortunate people won't learn from others mistakes. Street racing/reckless driving... whatever people may call it, it needs to stop.